Hunter Paige is a dual purpose salon located in the heart of Brentwood, Tennessee. 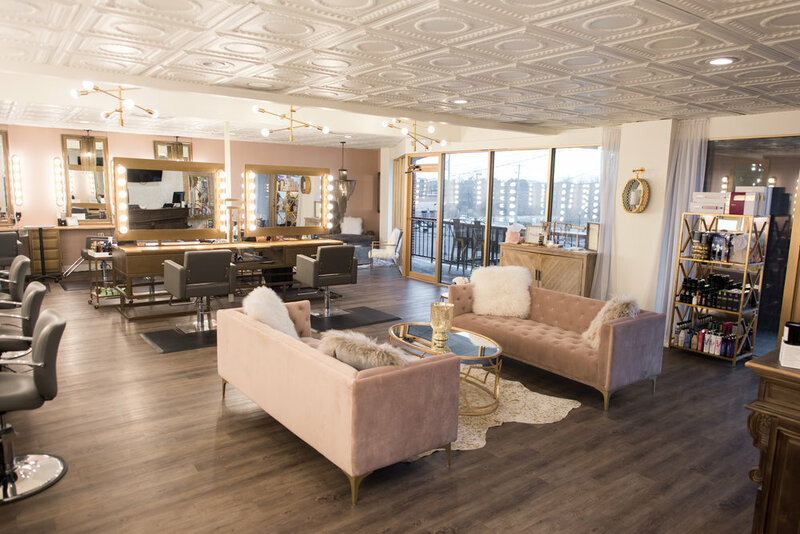 Melissa Schleicher, Co-Owner with Beth Neuroth, decided that she needed to expand her business, Parlour 3, in order to accommodate the quickly growing wedding market in Nashville. The salon is home to 9 stylists who during the week offer services including haircuts, coloring and blowouts. To see some our work, follow us on Instagram. Hunter Paige was also created as a home for our freelance bridal team to do hair and makeup for weddings and events. The salon can be rented out so that you can enjoy getting ready for your big day with your friends and family. For wedding inquiries please contact events@hunter-paige.com. You are getting married and this will be one of the most special and memorable days of your life. Thank you for checking out Hunter Paige and allowing us to potentially be a part of this amazing day. We know how important this time is and we try to make this process easy, organized, and enjoyable for you. Here at Hunter Paige we offer the complete bridal beauty package. From the moment you decide to book us all the way to after your wedding day, we have options for you. Our focus is on pampering you and helping you feel like your best self during this season. We offer services during your engagement, on your wedding day and entering your new life as a Mrs.
We do NOT provide champagne or orange juice for on location weddings! We do NOT provide any food for weddings that are in salon. We can order food for you and can make arrangements (for an additional fee). Just let us know up to a week prior if you would like our team to help with the food. + Can we bring our own Champagne & Wine? Yes, you can bring your own champagne and wine into the salon. For In Salon services we will be providing 2 bottle of champagne as well as orange juice. We also offer soda, filtered water, and coffee for additional options. + Do you have a place for our party to store food/champagne that we bring? We have a fridge in the back that has limited amount of storage. Please let Danielle or Alli know how much space you need prior to the event and we can make as much space as possible. + Do you have bridal suites? + If you are doing your own hair or makeup, are there mirrors you can use to get ready in? Yes, each suite has 1 big mirror you can use. We also have two bathrooms with smaller mirrors. On Location Payment: If we are sending our team on location to do hair & makeup, we send out an email the Monday of your wedding week to remind you of your final balance. Your final balance will be on hold under your name at Hunter Paige. When you call and pay the full balance the front desk will take care of you. There will be 20% gratuity added to all on location services which is reflected in your contract. In Salon Payment: We will contact you the week of your wedding to ask about any payment details for the day of. You can pay all together or individually for the services in salon. You can also make bulk payments ahead of time if you would like to pay for everything before the big day. Sunday Services Payment: We do take events, weddings, and makeup services on Sunday’s. Due to the salon not being open on Sunday’s it will be an additional cost to book appointments on a Sunday since we are out of our businesses scheduled hours. If you are booked for makeup or hair services on a Sunday, you have until the day before (Saturday) to call Hunter Paige Salon to pay for your services in advance. The travel fee is 54.5 cents a mile round trips per stylist/artist we send out to you. Out- of- State Fee’s: If you would like to send our team to out of state, you will be responsible paying for all accommodations for the trip. This includes booking/arranging flights, car expenses (whether it is a rental or Uber), Hotel expenses etc. + What is your suggestion for tipping the stylists/artists? We recommend a 20% gratuity for each stylist/artist that provides your services. + What type of payment do you recommend for tips? We accept all forms of payments for tips. + Can I tip on my debit/credit card? A one-time non-refundable booking fee I required to reserve the date of your event. This can be paid by cash, check, or credit card. The booking fee does not go towards your services. It goes towards reserving your date, stylist/artist, supplies needed that day, and the scheduling/coordination we do. + Can I add on a service day of my wedding? Additional people may be added day of the event ONLY if time permits and if the stylist/artist agrees to services. Client MUST pay by check written out to Hunter Paige by Parlour3 or call Hunter Paige (615-651-8075) and pay over the phone before service is performed. + If someone in my bridal party is sick, do I still have to pay for them? You are not allowed to subtract or substitute people or services once the document has been signed. If a substitution is absolutely needed the client must notify Danielle Muller at least 48 hours before the actual wedding date. + Can I switch times or appointments day of the event? Switching times/appointments is NOT allowed day of the event, although we are willing to work with you depending if time permits. Please let either the front desk or team member know as soon as possible so we can see if switching times will work for you. + Does my hair need to be washed the day before? If our team members need to do an additional blowout due to wet hair or greasy hair, there will be an additional charge of $25.00. The team member will communicate this with you before services are done. + Does it cost more if I have extension in? Because extensions tend to add additional time onto services, we will charge an additional fee if you do have extensions depending on the amount you have, and the time it takes the stylist to do your hair. They will let you know in advance if you will require this additional fee. We also will ask these questions on the contract, to avoid any additional fee’s day of. + Will I get touch ups before the team leaves? The Hunter Paige Wedding Team will stay 15 minutes after the last scheduled appointment to do touch ups. Any additional time after this will be $125.00 per hour per stylist/artist. + Am I required to have a trial run if I am a Bride? Yes! We require the Bride to have a trial run done with their stylist/artist prior to their wedding date. This helps make your wedding day smoother, so you and your stylist/artist are more comfortable. + When do you recommend a trial run? We typically do trial runs after the contract is signed and the booking fee is paid. This ensures that the stylist/artist doing your trial run will also be doing your wedding. We recommend 30 days before your actual wedding date. + How do I book a trial run? One of our Hunter Paige event coordinators will reach out via email to book your trial run. If you have specific dates you would like to schedule your trial run for please reach out to our event coordinators via email. + Is the trial run included with my final payment? No, the trial run is paid separately from the wedding day payment and booking fee. Regardless of the outcome of the trial run you are required to pay for the services. Tipping is optional for this service but highly recommended. + What if I decide to change my original hair style from my trial run? We would recommend you contact our Event Coordinator right away, so we can schedule another trial run with your stylist. You will be responsible for paying for additional trial runs. + How much time does a trial run usually take? You are allotted 2.5 hours for your hair and makeup trial run. Any additional time after this period is $1.00 per minute. + Can I request a certain hairstylist or makeup artist? Every makeup artist and stylist on the Hunter Paige wedding team has undergone and extensive audition and interview process to be a member and representative of our company. In order to maintain their position, they must complete regular education and training with our beauty director, Jen Tsourvakas. Due to high demand of all of our team members we ONLY allow the Bride to make a request for her personal services. One makeup artist and one hair stylist (or one person who does both services) may be selected for these services. Hunter Paige’s event coordinators will select from our artists the perfect team that will fit the esthetic of your wedding and have the availability that date. You must make this request within 30 days of signing the contract. There is no guarantee that the artist requested will be available on the date due to the number of weddings that are booked. Hunter Paige is not liable for any illness or emergencies that may occur that would prevent your desired stylist/artist from being a part of the wedding day. We will make sure that there is a team member to replace them if this were to occur.